It’s believed that Brandin Cooks and Justin Davis (shown in photos when both were at Lincoln High in Stockton) are the sixth set of high school teammates from California to reach the Super Bowl in the more than 50 years of game’s history. Photos: Mark Tennis. Thanks to a very high total of 11 players on the Los Angeles Rams who are from California high schools, the Golden State once again is back on top with the most Super Bowl alums in this year’s game after surrendering the mantle to Texas last year. Two of the Rams’ players were teammates at Lincoln High of Stockton in the 2010 season, which prompted us to call their coach and figure out how many times a pair of teammates have done the same. We counted six since the Super Bowl began in 1967. Note: We hope you enjoy this free post on CalHiSports.com. If you want to see more exclusive football content, such as our archives of every all-state team that’s been selected and our archives of California players who’ve been in every Super Bowl since the first one in 1967, every one of our 2018 season all-state football teams and for additional state record updates, that will all be for members of our Gold Club only. To see how you can sign up, CLICK HERE. There is a difference between a high school having two former players in a Super Bowl and one that has two from the same school who were on the same team. As the controversial ending between the New Orleans Saints and Los Angeles Rams was playing out in the NFC championship, it wasn’t a secret which team former Lincoln High of Stockton head coach and current athletic director Brian Gray was rooting for. “I’d be lying if I said I didn’t want that outcome, knowing how special it would be,” Gray said of the Rams pulling out their overtime victory at the Superdome and punching their ticket for this Sunday’s Super Bowl in Atlanta against the New England Patriots. What Gray is talking about is having not one but two former players in the biggest single-day sporting event in the nation and two players who were on the same team. Most Ram fans are well aware of the abilities of Lincoln grad Brandin Cooks, the team’s fastest, quickest receiver. But they may not know that when Cooks was a senior wideout for the Trojans during the 2010 season, the team’s young, upcoming sophomore running back was Justin Davis, who is a back-up running back and special teams player for the Rams. Cooks and Davis also were sprinting teammates on the Lincoln track team. They didn’t go the same college — Cooks went to Oregon State while Davis went to USC — but didn’t end up on the same NFL team until last summer when Cooks signed a free agent deal with the Rams after he played in the 2017 season for the Patriots. One of the reasons Davis was inserted as a sophomore running back during Cooks’ senior season was to prevent defenses from concentrating too much on stopping Cooks in the passing game. He became a well-known recruiting target after earning MVP honors among receivers at the 2010 Northern California Nike Combine (now known as The Opening) held at Stanford. Davis also shined at the Nike camp two years later along with Lincoln quarterback Zack Greenlee (now at teacher at Lincoln) and a quarterback from Marin Catholic of Kentfield named Jared Goff (the future No. 1 draft pick and the Rams’ quarterback). Having the two former Trojan teammates in the Super Bowl sparked some research into the Cal-Hi Sports archives of Super Bowl alums, which showed that this is the sixth time there have been former teammates playing in it. The last time it happened was in 2014 for Colony High of Ontario with defensive back Omar Bolden (Patriots) and linebacker Bobby Wagner (Seahawks). The first time it happened was in 1973 for Compton High with receiver Roy Jefferson (Redskins) and tight end Marv Fleming (Dolphins). The other three: Los Angeles High in 1976 for Cal Peterson (Cowboys) and Jimmy Allen (Steelers); Crescenta Valley of La Crescenta in 1989 for defensive back Tom Holmoe (49ers) and back-up quarterback Mike Norseth (Bengals); Berkeley High in 2002 for defensive back Je’Rod Cherry (Patriots) and defensive lineman Chidi Ahanotou (Rams). This wouldn’t count a year like 2008 for De La Salle of Concord, which counted back-up quarterback Matt Gutierrez (Patriots) and receiver Amani Toomer (Giants) because those two weren’t actually teammates in high school. Three years ago, Anderson was on top of the world after he accounted for 100 yards of rushing and receiving and scored a touchdown for the Denver Broncos when they won Super Bowl 50 at Levi’s Stadium in Santa Clara over the Carolina Panthers. He was almost out of football completely this season when he finally signed with the Oakland Raiders in early December after being released by the Panthers. He didn’t play for the Raiders, but the Rams picked him up two weeks later as the team was dealing with an injury to No. 1 back Todd Gurley. Anderson has had three 100-yard rushing games for the Rams since then, including 123 in a playoff win over Dallas. A back-up tight end for the Patriots, Anderson was a wide receiver in high school and played well enough to attract some college offers. He went to Cal and made it initially in the NFL with the Houston Texans. Woodside High’s Julian Edelman and San Mateo Serra High’s Tom Brady are two of the most popular New England Patriots and are from the same county in California. Photo: clutchpoints.com. This is Brady’s all-time best ninth Super Bowl appearance (regardless of position) and he is looking to win for the sixth time after last year’s loss to the Philadelphia Eagles. Brady already had become the first QB to lead a team to five Super Bowl wins two years ago when he helped rally New England from a 28-3 third quarter deficit to beat the Atlanta Falcons in overtime, 34-28. Brady is 41 years old for this year’s Super Bowl and it doesn’t look like he’s retiring any time soon. His high school also has had one other Super Bowl MVP in NFL Hall of Fame receiver Lynn Swann of the Pittsburgh Steelers. He was the long-snapper for Patriots last season and returns to the Super Bowl this year. The Patriots had another long-snapper with multiple Super Bowl appearances from California — Lonnie Paxton of Corona Centennial. The former two-time all-leaguer for the Cougars is listed as one of the Patriots’ team captains (along with Tom Brady). Chung was a starter in the secondary for Super Bowl winning teams in New England in 2015 and also two years ago when the Patriots topped the Falcons. We wrote up Cooks last year when he was the primary deep receiving threat for the Patriots. He suffered a concussion during the actual Super Bowl, however, and couldn’t continue in the second half. This year, Cooks has gotten back into the game but with the Rams. He began his career with the New Orleans Saints after an All-American career at Oregon State. As mentioned above, Justin was a sophomore tailback and an all-state sophomore when Brandin Cooks was a senior receiving standout at Lincoln. He went on to earn all-state honors as a junior and senior and then played at USC. Davis doesn’t see much action at running back for the Rams, but has earned his roster spot through his abilities on special teams. A mainstay of the Patriots in recent seasons and a longtime favorite target of fellow San Mateo County native Tom Brady, Edelman is back in the Super Bowl after being on injured reserve for last year’s game vs. the Eagles. When he was last in the game, Edelman’s shoetop catch with 2:21 left helped the Patriots drive for the game-tying touchdown. He was on an undefeated team at Woodside, showing all of that versatility as a quarterback, defensive back. We remember Goff when he made a huge splash as the starting quarterback at Marin Catholic early in his junior season. He played varsity as a sophomore as well and despite a loss to Madison of San Diego in the 2012 CIF Division III championship game he gained entry into the state record book with 7,687 yards passing and 93 TD passes. We went to see Jared play once at Vacaville where we took our longtime friend Bruce McIntosh. It was the last game Bruce ever attended. He died at age 87 in early December of 2017. An all-state junior for us at St. Bonnie in 2008, Hill was a solid prospect who eventually signed with Oregon. The Seraphs forfeited all of their wins from 2009 (they were 11-2) due to an eligibility issue with Hill. After starting his NFL career in Cincinnati, Hill was claimed off waivers in 2015 from the same Patriots team that the Rams are now facing in the Super Bowl. 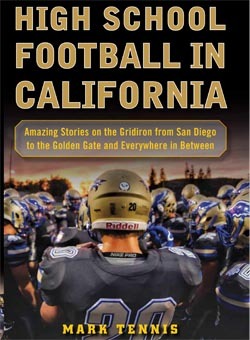 There’s one chapter and part of another in our book centered on former California players and coaches in the Super Bowl. Order it now by CLICKING HERE. An undrafted player from the University of Washington, Littleton has emerged over the last two seasons as one of the top defensive players on the Rams’ roster. In just two seasons, he’s gone from a backup role into collecting 12 tackles in the NFC championship game vs. the Saints. Another Bay Area QB in this year’s Super Bowl, Mannion played at Foothill under legendary Falcons’ head coach Matt Sweeney along with his father, John, who coached alongside Sweeney for many years and was the head coach when Sweeney took a break. Sean passed for more than 3,500 yards as a senior at Foothill, then went to Oregon State where he became one of the top QBs the Beavers have ever had. Mannion got a start last season for the Rams after they had wrapped up their playoff positioning. Despite playing for a team that didn’t throw the ball around that much, Mundt was an all-state small schools pick for us in 2012 after helping the Raiders win the CIF Division IV state title. He went to college at Oregon where he played tight end and H-back for teams led by Heisman Trophy winner Marcus Mariota. He has been up-and-down on the Rams’ roster and practice squad and also is known as an effective blocker in the run game. The son of our overall State Coach of the Year for the 2018 season, Michael Peters also of McClymonds, joined the Rams this season after starting his career as one of the most exciting young corners in the NFL. At Mack, Marcus was more well-known to us for returning kickoffs and/or punts for scores. He had six during his senior season, which tied the state record first set in 1998 by Sioele Tuipulatu of Hawthorne. Make it seven Pro Bowl selections for the career of Slater, who got another one this season for special teams. He’s been one of the Patriots’ mainstays in recent seasons. The son of NFL Hall of Famer Jackie Slater also still holds Servite sprinting records in track, including a 10.62 in the 100 meters at the CIF state finals. Here’s a player who’s made it to the Super Bowl via the unknown, undrafted route. At Franklin, Ethan was an all-league player but didn’t give up on his dreams and went to San Joaquin Delta College for one season, then Sacramento City College for one season and then to West Texas A&M. He was an undrafted free agent in 2014, but signed as a free agent with the then St. Louis Rams. Westbrooks earned a roster spot for the 2014 season and he’s been on the Rams’ roster ever since. Named as our 2009-10 State Athlete of the Year for the boys, Woods was electrifying on the football field for the unbeaten CIF Division III state title team at Serra with 66 catches for 1,112 yards and 15 TDs plus 96 tackles and 25 career interceptions as a defensive back. Woods also had the second-fastest 400-meter dash time in the nation (46.17) and anchored the Cavaliers to a 4×400 state title in the relays. He had 180 yards receiving and two TDs in the CIF state finals vs. Marin Catholic of Kentfield. If curious, Jared Goff, Robert’s future QB teammate, hadn’t yet arrived as Marin Catholic’s starter. More Fun Facts: Neither of this year’s two head coaches, Bill Belichick of the Patriots or Sean McVay of the Rams, is from California. The last head coach from a California high school to win a Super Bowl was Pete Carroll (Larkspur Redwood) in 2014 for the Seattle Seahawks…. California’s total of 17 this year is five more than last year, and edges Texas and Florida for the state with the most Super Bowl alums. Texas had the most last year with 13 (compared to 12 for California and Florida each). Texas still came close this year with one of its highest totals ever (16) while Florida had more than last year (13) but still not enough to catch California and Texas. The Golden State had the highest total two years ago with 14, had the highest total with 12 in 2016 and in 2015 crushed it with a whopping 22. The state’s all-time highest total of 25 was set in 1995 by the San Francisco 49ers and San Diego Chargers and tied in 2008 by the Patriots and New York Giants…..
Two other schools nationally also can match Lincoln of Stockton for having two teammates in the Super Bowl. One of them is obvious as twin brothers Devin and Jason McCourty are now on the Patriots’ roster for the first time together. The McCourty twins are from St. Joseph of Montvale, N.J. The other school is St. Thomas Aquinas of Fort Lauderdale, Fla., which we’d guess has the most alums currently in the NFL than from any other high school nationally. When the Raiders were No. 1 in the ESPN/Student Sports FAB 50 in 2009, they had running back James White and receiver Phillip Dorsett, who are now both key offensive performers for the Patriots….. Thanks for the note, Art. Hope you are doing well. You missed Dennis Smith and Mel Kaufman, Santa Monica High teammates in 1975, who play opposite each other in SB XXII for the Denver Broncos and Washington Redskins respectively. Have it in the archives and had it in the last printed record book, but missed it for this post. Thanks for catching that.